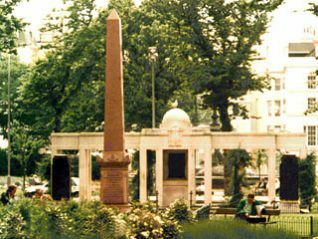 The marble obelisk in the foreground of the photo was erected by officers and men of the First Battalion, Royal Sussex Regiment in 1888. It commemorates comrades who died of wounds and disease in the Egyptian campaign of 1882 and the Nile river expedition of 1884-5 which tried to relieve General Gordon at Khartoum. The memorial behind the obelisk records the names of the 2597 men and 3 women from Brighton who died in the First World War. It was designed by John W. Simpson in the style of a Roman water garden, and unveiled in 1922 by Earl Beatty, Admiral of the Fleet. This is one of the most beautiful was memorials that I have ever seen. It makes me proud, but so sad, so very sad.